The islands have much to attract tourists, including museums, walks, and even a small golf course. Wildlife is a particular attraction during the breeding season. Tristan da Cunha has always welcomed visitors, and in the 21st Century it is a well organised community which can offer comfortable accommodation and a range of services for privileged visitors who are able to secure a passage. 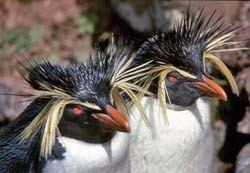 Left: Rockhopper Penguins on sentry duty! English is spoken on Tristan da Cunha. There is a distinct local dialect with words derived from the many cultures (Scottish, English, St Helenian, South African, American, Dutch, Italian, and Irish of the original settlers and visitors). Nevertheless, is it more easily understood by visitors than many strong regional British accents! Local currency is the UK pound sterling. Credit Cards and personal cheques are not accepted. Euro/Dollars/Rand may be exchanged at the Treasury in the Administration Building during office hours. Local time is GMT. All Government Departments, including the Island Store, are open: Mon/Thursday 0800-1430 (Summer) 0830-15.00 (winter), Friday 0800-1300 (0830-1430 in winter). Both the Anglican (St Mary’s - 0800) and Catholic (St Joseph’s - 0900) Churches have regular Sunday services to which visitors are welcome. The Post Office is open during office hours, and at additional times during cruise ship visits, and sells a range of stamps, postcards and philatelic collectors' items. Any mail sent ashore from a visiting vessel for posting on Tristan must be stamped or accompanied by sufficient funds to cover postage costs. Because of the limited shipping services, mail posted from Tristan can take some months to arrive at the overseas destination. The Museum as well as the main Handicrafts and Souvenir shop is located alongside the Post Office in the Toursim Centre. Handicrafts and souvenirs are also on sale in the Island Store and Rockhopper Gift Shop, and during cruise ship visits may also be available in the old 'Café', Prince Philip Hall Community Centre, and in some local homes. The Albatross Bar at Prince Philip Hall is open during cruise ship visits to offer a range of alcoholic and other drinks, together with light refreshments. Café da Cunha, located in the Post Office and Tourism Centre, also offers hot drinks, soft drinks and light refreshments, and sometimes serves hot meals. Café da Cunha provides light lunches every Wednesday to eat in or take away, with varied menus displayed in advance. A range of food and drink items are also available for purchase at the Island Store, which has sufficient stocks for all visitors. The old 'Café' building near Prince Philip Hall is no longer a café, but is sometimes rented out to sell handicrafts and snacks to visitors, and for parties. Available only from the Factory - please contact the Factory Manager. Public toilets are located adjacent to the old 'Café', in Prince Philip Hall, below the Council Chamber in the Administration Building, and in the Post Office and Tourism Centre. Tristan is a tiny community of under 300 islanders. Visitors are most welcome, indeed the hospitality of Tristan people is famous. Occasionally trust can be abused and islanders may well be shy and resentful to visitors who approach with a camera raised and whose purpose may appear to be to report to the outside world with very limited knowledge. Tristan’s climate is temperate and oceanic with rapid weather changes. Almost all visitor activities are dependant on suitable weather conditions. Despite the weather, be assured that you will always receive a warm welcome to Tristan. All visitors staying on Tristan must have a confirmed and fully paid return passage, health insurance to include cover in case of medical evacuation to Cape Town and sufficient funds for the duration of their visit. (* Inaccessible Island is a World Heritage Site, and landings are restricted for environmental and wildlife conservation reasons.). There are strict controls on all bio-imports to prevent damage to the Tristan da Cunha Islands' unique ecosystem. See the separate Conservation Ordinance Page for details. The import of alcohol is strictly controlled. Visitors will be only allowed to import: two 750 ml bottles of spirits, and 12 x 340ml can or bottle beers. All cruise ship passengers must sign an accident waiver (Passenger Indemnity Declaration) form before coming ashore, and all visitors to Tristan must have adequate travel insurance to cover the costs of any medical treatment including, if required, the costs of medical evacuation to Cape Town. Current medical/dental charges for all non-residents are available on application. Visitors are invited to contact tristandc.com Webmaster on webmaster@tristandc.com to send a report, with JPEG files for the website and Tristan da Cunha Newsletter which may be of interest to Tristan Association members and the general public. Visiting crew and passengers are likely to be enthralled by the Tristan community and want to keep in touch and find out more. The UK based Tristan da Cunha Association produces two full colour newsletters each year and organises events, including a residential Annual Gathering. Join us by checking out the Tristan Association pages. Marked: Crown Agents Bank A/C 33870050 and quoting your name. Please note that whilst every effort has been made to make information of these pages accurate, the Government of Tristan da Cunha reserves the right to change local by-laws and charges. Visitors should check firm prices at the time of booking.